The Monitor conducted a phone interview with Cheech Marin regarding tomorrow's lecture at the University Of Texas Pan American. It's part of the school's Hispanic Science, Technology and Engineering Week. During tomorrow's lecture, Cheech will discuss his Chicano art collection. Afterwards, he will be signing autographs. This is rare. It's fairly difficult to obtain his sig. Update: At last night's UTPA presentation, Cheech revealed that this is the second time he's been to UTPA. The first time was while doing standup with Tommy during the 70s. Cheech said he sees himself "popularizer" of Latino art. The new Cheech and Chong t-shirts, Que Paso and Sitting are now in stock. Que Paso features a photo of them flipping the bird from the movie Nice Dreams. Sitting features a photo from Next Movie. During an interview with Don Johnson about his new WB series, Just Legal, he was asked if Cheech will be appearing on the show. "You never know. I love my brother. He is my true brother. I would do the phone book with Cheech. That could be interesting. I'll have to kick that around with Jonathan." Last night, Tommy Chong and others performed at a Harry Anderson organized Comic Relief comedy show in Austin, TX. "The audience cheered Ron White and Tommy Chong like rock-star gods". The event raised $85,000 for the Red Cross. Bobby Capps (well-known for his Free Tommy protests) was at William Jessup University today to protest Tommy Chong's wrongful persecution. John Ashcroft was there to kick off the university's new public policy. his anti-Ashcroft sign (Adolf Ashcroft Violates Peoples Rights Abuses Law, America Needs Crude Not Crud No More Texass Candidates). He had expected to be given a hard time. On the contrary, two university heads brought out coffee and donuts. Most of the people were super-friendly. Later on, two beautiful coeds, Eleathia and Taylor (forgive me if their names are spelled incorrectly) came over to take a photo with Bobby. They weren't aware of Ashcroft's antics and weren't familiar with Cheech and Chong, but they will be visiting this site later (email us your photo). Capps had this to say, "As for people traveling into and out of the university, I would say there were three kinds: people who shook their head and then proceeded like they didnt see me, people who flipped (me) off...great christian,...and last but not least, the horn blowers (that gave me a) thumbs up. No one bothered me. In closing I would like to say William Jessup University had wonderful manners and I believe is a very nice place to visit and I hope more will go to school there in the future." Thinkfilm has purchased the worldwide rights to AKA Tommy Chong, a documentary about Chong being arrested and sent to prison for selling bongs via the internet. The film cost $200,000 to make and ThinkFilm paid $1.5 mill for the rights. They plan a March or April release. Today, we attended the Latinologues press conference at the Helen Hayes Theatre. The place was packed with reporters. We were only able to speak Cheech Marin briefly because he was heading back to California this afternoon. We asked him about the reunion film and the script. 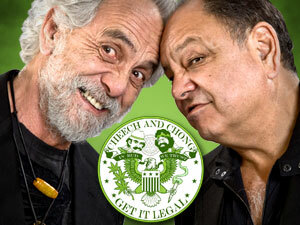 Contrary to previous reports, Cheech Marin and Tommy Chong never finalized the movie script. They came up with the premise together, but that was it. He didn't seem comfortable discussing it. We will have a more in-depth interview with Cheech when he returns in October. We brought Brett Alexander with us so he could show Cheech the Cheech Marin signature guitar, as well as give Cheech the bust he created. In the past, Brett has also created guitars for Tommy Chong and legendary blues musician, Buddy Miles. In addition, we had the opportunity to speak some of the other cast members. Rick Najera said that he saw our review and was very appreciative. By the way, Shirley looked stunning. Cheech intro & Rick Najera "border patrol". Cheech signing the axe.Reporters with Rick and Shirley. Purchase tickets here. It's a small theater so every seat is close. If you would like to attend and have any interest in making this a miserable event for John the Egotist, its a free event. RSVP by Sept 14,200 email tooAcademics@jessup.edu or call 916-577-2215. Protest this egotist who put Tommy Chong behind bars on trumped up charges. Tonight was the first night of previews for Rick Najera's Latinologues. The play, which takes place at New York's Helen Hayes Theatre, marks Cheech Marin's Broadway directorial debut. The show was fanastic! The audience and myself included could not stop laughing. I was amazed that the first show could be flawless, but it was. Cheech Marin's excellent direction, as well as the great actors (Rick Najera, Eugenio Derbez, Rene Lavan, Shirley A. Rumierk) are to thank. I loved it so much so we will be returning. We also expect to have an interview with Cheech Marin later this week. If you live outside of the tri-state area, we recommend planning a vacation around this. During an interview at the Toronto International Film Festival, Tommy Chong spoke about AKA Tommy Chong, a documentary about Chong being arrested and sent to prison for selling bongs via the internet. Tommy says that "The United States is under martial law, it's under dictatorship." The documentary claims that the DEA spent $12 million pursuing Tommy and only $20 million pursuing Osama. "It's like the weed culture. You just wait, it'll change. Everything changes. Bush won't be in power forever, Ashcroft is already gone. There's going to be another cycle and it's going to go the other way." It's hard to believe it's been nearly four years since that tragic day. Not a day goes by that I don't think of Kristine. She was a close friend of mine that died in the towers. I miss her so much. She was truly a beautiful person. Tommy has continued his Cheech smear campaign. In yesterday's edition of the New York Post, Chong calls Cheech a "sellout" and a professional Latin. By professional Latin, Tommy is referring to the fact that all of Cheech's projects are related to Hispanic culture. These projects include the Latinlogues play, Chicano Visions art exhibit and his directing of the Spanish version of Dracula. This is the second such article in recent weeks. Tommy mentioned Cheech being a sellout during an interview with the Los Angeles Newspaper Group. He goes on to say that he's a sellout for playing a cop on Nash Bridges. From what we can gather, Tommy is upset that Cheech has forgotten his comic roots. Ironically, Tommy was a guest during a Nash Bridges episode. We've yet to year Cheech Marin's side of the story. We hope to have some comments from him next week. During an interview at the Toronto International Film Festival,Tommy Chong discusses dancing the tango with prisoners at Taft. Tommy is in Toronto for a showing of AKA Tommy Chong, a documentary about his wrongful persecution. Confirming the story we broke earlier this week, the Cheech and Chong reunion film has been cancelled. All Cheech says is that something happened. Cheech goes on to say they might do something together, but it won't be a film. Latinologues, the Broadway play Cheech Marin is directing, opens next Tuesday. The six-week preview begins September 13th, but the show offically launches October 23rd. It's a 12-week engagement ending December 4th. The sign was installed this past weekend. Next week, we'll be seeing Cheech Marin at the first night of the Latinologues. Post questions you'd like us to ask Cheech on our message board. Tommy Chong has written a blurb found on the front cover of a new book titled Busted! Drug War Survival Skills. It was written by M. Chris Fabricant and features information such as why you should use wooden pipes. We've yet to find a positive review for the new Miramax film, Underclassman. The film starring Nick Cannon, Shawn Ashmore and Cheech Marin is about a detective that goes undercover at a private school to bust a stolen car ring. Cheech Marin is the police captain. Acccording to Westword "Miramax isn't exactly hyping Underclassman; it's been on the shelf for so long that the soundtrack still features the original, politically incorrect version of the Black Eyed Peas song "Let's Get Retarded" (long since retitled "Let's Get It Started"."